New formulations for high protein and high fibre snacks, plus innovative co-extruded snacks, were introduced by Baker Perkins at Snackex in Istanbul in June. Foods high in protein and fibre are becoming mainstream as consumer diet awareness grows. Snacks are a convenient and palatable carrier for these beneficial products, and any existing extruded or co-extruded product recipe can be easily augmented. To be labelled as a source of protein, 12% of the energy in a product must legally come from protein; for claiming high protein the figure is 20%. Wheat flour contains a protein base of between 8% and 15%, depending on the variety of wheat; oats also include proteins. Wheat based gluten proteins, dairy based whey proteins and fibre can be introduced to any extruded snack in powder form; soluble fibres can be added to co-extruded products. Extruded snacks with bread-style doughs such as croutons, crispbreads and pita are all appropriate as high protein products. Indulgence products retain a significant percentage of the snacks market, and new die technology developed by Baker Perkins allows the co-extrusion of tubes containing two fillings. They can be marketed as bar sized premium snacks with contrasting or complementary fillings such as chocolate and orange cream or chilli and salsa. This is an extension of the co-extrusion process which involves extruding a hollow tube of cereal while simultaneously injecting a low-moisture cream or paste filling into the centre. The tubes are then cut or crimped into pillows, bars, sticks or wafers to form bite-size or hand-held snacks. A suitable filling can elevate the products into the premium indulgent or healthy snack categories where growth potential and margins are significantly higher than standard extruded snacks. Extrusion can process ingredients from a wide range of sources including grains, vegetables, legumes and fruit. Texture can be varied from light and crispy to hard and crunchy while a variety of post-extrusion forming and cutting techniques can be used to add interest and variety. A crucial advantage of the extrusion process is that, as a business expands, a Baker Perkins line may be extended at any time to broaden or even completely change the range of products being made. A standard line comprising a Baker Perkins SBX Master™ extruder, dryer and flavouring system is capable of making direct expanded products such as balls, curls, chipsticks and profiled shapes. With additional dies and other equipment the range can be expanded in stages to create a portfolio of high specification, complex products including whole grain / multigrain / shredded snacks and sweet or savoury filled pillows with intriguing shapes, textures and surface patterns. 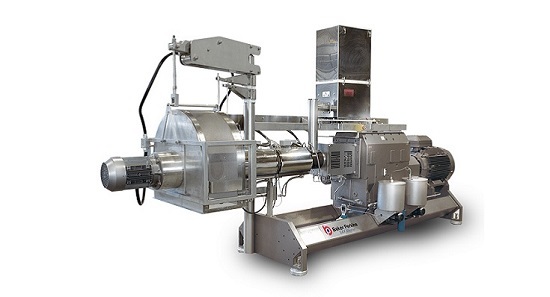 Today’s sophisticated Baker Perkins twin-screw extruders are designed to produce consistent high quality products at efficiency levels that minimise downtime and waste. They are automatically controlled using parameters stored in pre-configured user recipes. Automatic start-up and shut-down is crucial to smooth and efficient operation. Machines are automatically sequenced from warm up to production, optimised to minimise time and material waste. There is no operator involvement, and therefore no opportunity for error. The shut-down sequence is similarly automated to reduce waste and cleaning time.